I currently play with the United States Army Bands — I am associate principal flutist and play piccolo. 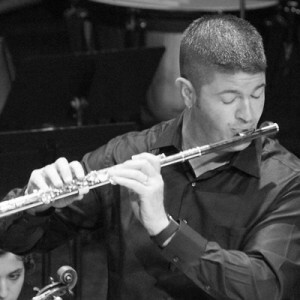 I also serve as the principal flutist for the Heartland Opera Company and as a substitute flutist for the Chandler Symphony and Scottsdale Symphony. 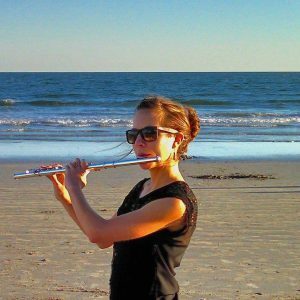 I have an active private flute studio and am a member of the Arizona Flute Society, the Flute Society of Washington, MTNA, and SAI music service fraternity. I earned my B.A. from Arkansas Tech University and am currently working on my M.A. at the University of Connecticut. 2. Have you ever been to an NFA convention before? If so, in what capacity? I have never been to the NFA convention before, but have heard about other’s experiences for years, and have always wanted to go. I’m incredibly honored and excited to finally be attending. 3. 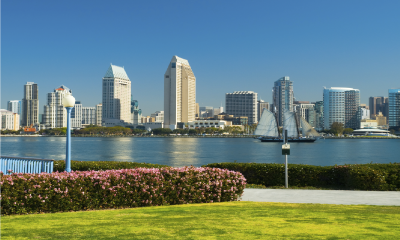 What brings you to the San Diego convention? This year, I will have the joy of attending my very first NFA “hitting the ground running” so to speak, as an exhibitor. I will be representing the US Army Bands, speaking to fellow flutists about career opportunities in the military and what it’s like to be a flutist in the Army. 4. What are you most looking forward to? What kind of things are you planning on doing or what is your “must do” list for this convention? I want to hit as many of the interactive presentations as possible. While I will also be going to several of the sit-down presentations as well, the interactive presentations are a must. It’s not every day you get the chance to do yoga or do a reading session with hundreds of flutists. I also am excited to see the exhibits. There are always so many instruments, music, and groups you never knew existed! 5. Is there anything about the convention that makes you nervous, anxious, excited more than anything else? I am most nervous about speaking with fellow flutists. Even though I will not be presenting, it’s a bit nerve wracking to go to such a large convention for the first time and be a vendor. I’m very beginning of my professional career, so I feel as if there are certain expectations when I’m surrounded by so many others that are already established in the field. I am incredibly excited though to be around such inspiring musicians! I am the former flute professor at Frostburg State University and a former army musician. I am working to finish my DMA at West Virginia University while I co-author The Flute Examiner, develop the Queen City Flute Workshop program, develop my own flute stand business, and do some instrument repair on the side. I have been to several conventions in the past. Most recently though I have been attending as a member of the Miyazawa flute team and spend most of my time helping people try Miyazawa flutes in the exhibit hall. I am attending once again as a vendor with Miyazawa. I really enjoy helping people find the perfect flute or head joint. Well, there is so much that I look forward too at these conventions. First of all, I get to see my Miyazawa family. I live in Maryland and they are in Iowa, so I don’t get to see them often. They really are like my family! I also get to see a lot of other people in the world of flutes that I only see once a year. It is like homecoming for a few days. I don’t get much time to explore the city although we do try to get out of the hotel for dinner most nights and there might be a zoo trip planned before the convention this year. I also enjoy getting a chance to try all of the flutes in the exhibit hall and that helps me stay on top of the latest so I can better inform my own students. And then there are the people! So many people! It is so much fun to see familiar faces and to meet all the new people that come every year. Everyone has a reason for attending and there are so many interesting people to meet and talk with. I am always excited to meet “new” friends, specifically those social media friends that I’ve never met in person. This year I will finally get to meet, in person, one of The Flute Examiner’s previous interviews and the author of the book that has motivated my dissertation research, Nicola Mazzanti! I also find myself a little nervous on the first day that the exhibit hall opens because I just want to help people fall in love with their flute the way that I have with mine. Although I always hope that someone will walk into my booth and I will hand them the flute of their dreams, I know that is not always reality. I just hope to be able to help people make informed decisions about whatever flute they fall in love with. I will say that I don’t look forward to how exhausted I am at the end of the convention but in the end, it is all worth it! Yes—participant. I’ve been going to the NFA convention since 2003 (Nashville). My first experience was as a sophomore in college. As a participant. This is my last official year as a “student”! I’m filling in for a flute choir performance, turning pages for a recital, and spreading The Flute Examiner love. Yes! I’ve been asked to turn pages for Ai Goldsmith’s performance on Thursday evening. I’ve never been so nervous! This gives a glimpse into what this convention was all about. It was my first time, and I felt as though I was immersed in all thing flute for 4 day! Really enjoyed meeting Keith at the Miyazawa booth, and talking about finding a cradle to hold my flute so the condensation doesn’t run out my keys…trying (then buying! LeFreQue, and seeing/hearing so many fabulous flutists! I encourage anyone who can to attend a flute convention in the future! Janet, we are so excited to have connected with you! Please keep in touch with us. Hopefully we’ll see you at future conventions!